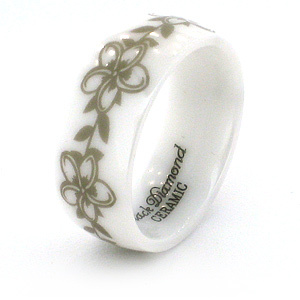 Solid white ceramic ring has a flower design all the way around. Domed center. High polished mirror finish. Ring measures 8mm wide. Made in USA. Comfort fit. Our customers may exchange this ring as many times as needed for the lifetime of the ring for a different size. Return shipping fees apply.